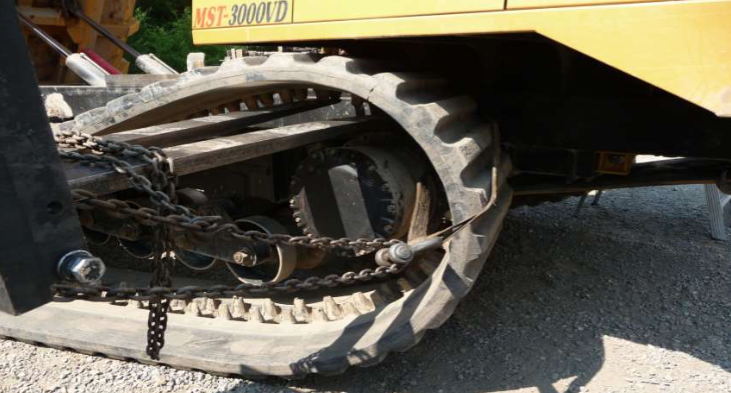 If you own or operate equipment that has rubber tracks then there will probably come a time when you need to replace them. 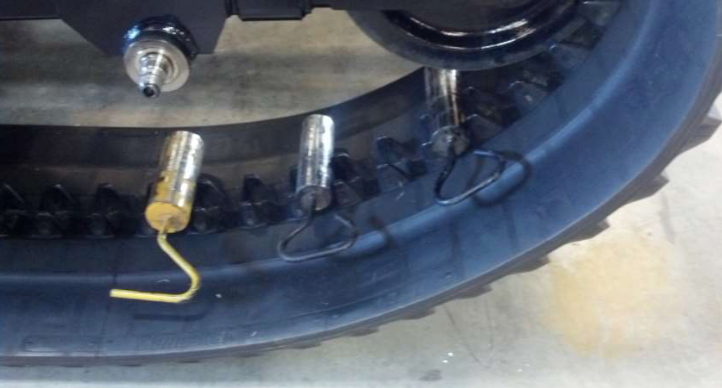 Rubber tracks can range anywhere from a few hundred pounds to several thousand pounds. 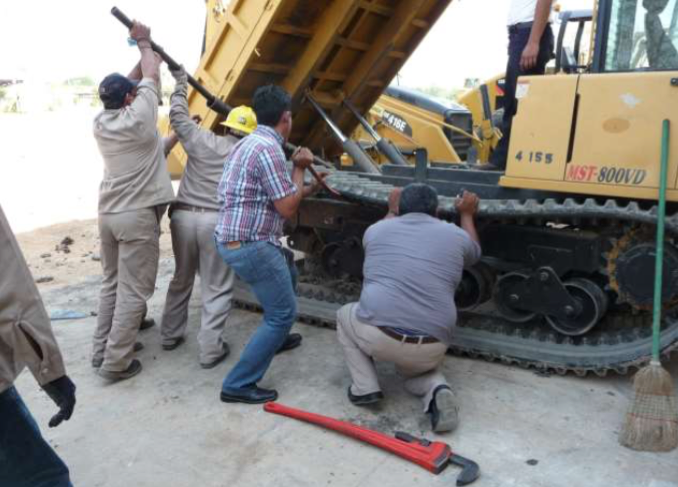 Because the rubber tracks are so heavy, it takes a great deal of force to remove and install them. With the amount of force required and the size of the equipment involved, it’s important to take every safety precaution to avoid personal injury or equipment damage. 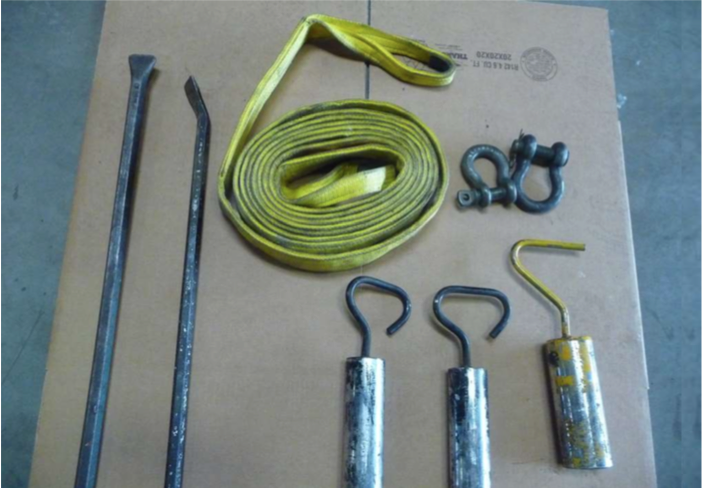 It’s possible to remove and install rubber tracks using several people and special tools (straps, toolbars, etc. ), but it’s recommended to use a relatively heavy duty piece of equipment. Forklifts are the most common choice. Once you have your forklift ready, find an open area that allows you to maneuver around the vehicle. Also make sure that you have a flat surface to work on to decrease the amount of movement during the rubber track installation. 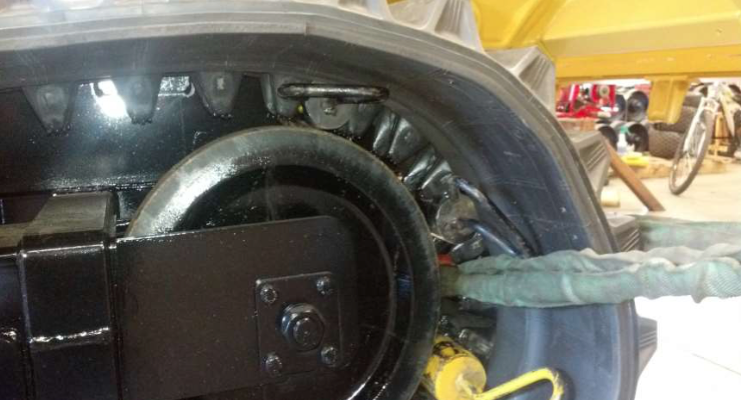 Before lifting the vehicle off the ground, slowly loosen the track adjuster valve, allowing grease to come out. Once you no longer feel pressure, remove the valve. Start by placing a pin in the cleat. Turn the vehicle on and rotate the track , rolling over onto the pin with the rear idler, causing the track adjuster to collapse. Continue rotating until the pin can be removed and clean up any expelled grease. Make sure the rear idler pusher is collapsed completely inside the tube and then reinstall the grease valve and tighten it. Next, with the vehicle still on the ground, use a forklift or tool to pry off the top carriers. Next, remove the triangle plates on the rear bottom rollers and remove linkage from the opposite track drive pump (safety precaution). Now you can raise the vehicle of the ground and place supports underneath. Only raise it high enough to get the bottom cleats under the bottom rollers. If the sprocket is in segments, remove three of them and leave one attached. If it’s all one piece, just leave as-is. 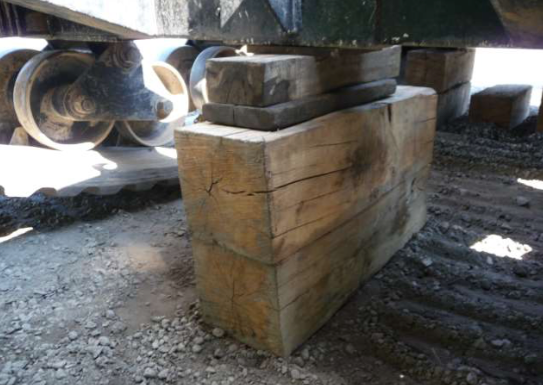 IMPORTANT: The machine should be blocked in such a manner to support the machine, so use heavy wood blocks or stands that are suitable for the vehicle’s weight. 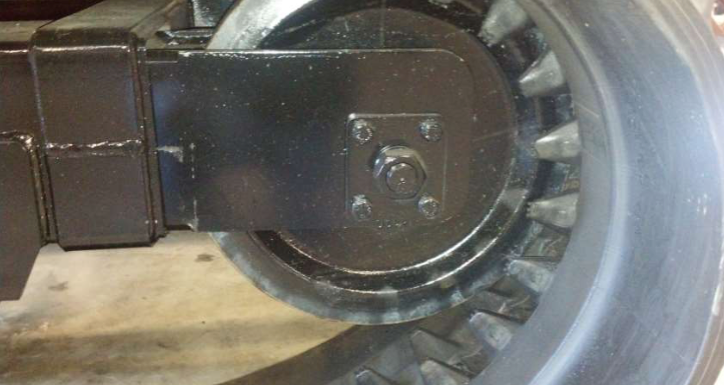 Place three pins of proper size in-between cleats double spaced, lower part of track under rear idler. 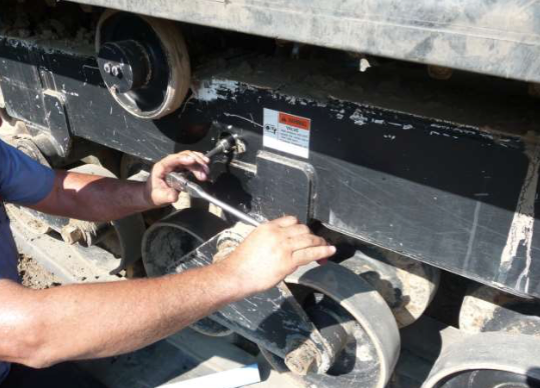 Start machine and carefully rotate the track to be replaced in slow forward causing the pins to lift the track cleats away and clear from the rear idler. During these operations pay close attention to the support of the machine. Shut machine off. Carefully work the track out from under the machine and off the front drive housing. Pulling on each end of track with straps. Carefully remove the track from the rear idler and pull it out . Work the track from under the vehicle and off of the front drive housing, pulling on each end of the track with straps. Push the track up beside the track frame. Try to center it. Keep the track close to the frame. Lift the track up and onto the pry bars in the track frame. Work the track onto the drive end and sprocket. If you have segment sprockets rotate the one segment left on till it is pointing straight up. This will help keep the track on. Keep pushing the lower part of the track under the bottom rollers. Lower the support enough to lock in the track to the inside of the rollers. Work the track onto the rear idler, until you get to the cleats. Place two pins of proper size and length in the cleats at the bottom of rear idler. Start the machine and rotate the pins around the rear idler. If all goes to plan the track will guide itself on. Reinstall the upper rollers and adjust track to proper dimensions as per machine model. Use pry bars (or similar tool) to support the top of the track when installing and work the bottom of the track, installing the track on the planetary first. Then push on the cleat (not the rubber track itself) so that the track slips under the bottom rollers. 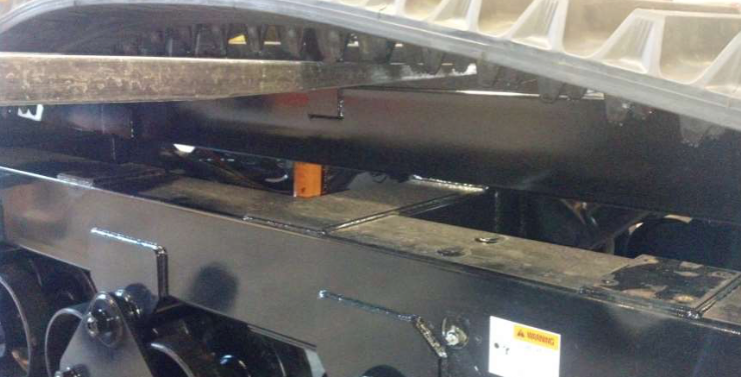 Once the track is completely under the bottom rollers, lower the supports a little to lock in the track. With two pins that fit all the way inside the links and extend to the inside of the track by 6 inches, rotate the track. If the pins are the correct side, the track will guide itself in place. Now install the bottom roller, replace the triangle plates and tighten the nuts. You can now lower the vehicle to the ground and finally install the upper carrier rollers. If all of these steps were done correctly, then you have successfully installed rubber tracks on your vehicle. If you have any questions on how to install rubber tracks or to order rubber tracks for your vehicle, contact Dominion Equipment Parts.